Applications are now invited from qualified Malaysian scholars to undertake a 3-6 months of research at the American universities during the FY2017/2018 academic year (August through June). The Fulbright-MCMC Senior Research Program 2017 provides opportunities for Malaysian academics to develop or update their research through interaction with distinguished counterparts in the United States. By providing a mechanism and support for meeting and interacting with the best of American scholars, the program seeks to promote dialogue on subjects of mutual interest to Malaysia and the United States. While these grants are typically researched focused, applicants who are prepared to add a lecturing component to their proposals are encouraged to apply. Further, all grantees will be asked to develop strategies for sharing Malaysian culture with social, civic and other groups while in the United States. 2. Source of financial support for accompanying dependents. 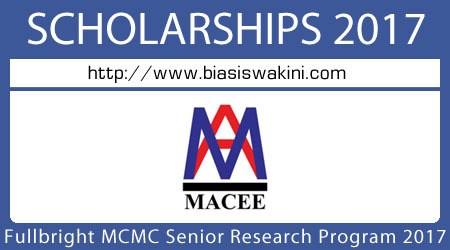 Kindly submit 4 sets of the complete applications to MACEE by January 9, 2017. Shortlisted candidates will be called for interview in mid-January 2017. Final announcement of awards will be made in May 2017. 0 Komentar untuk "Fullbright-MCMC Senior Research Program 2017"